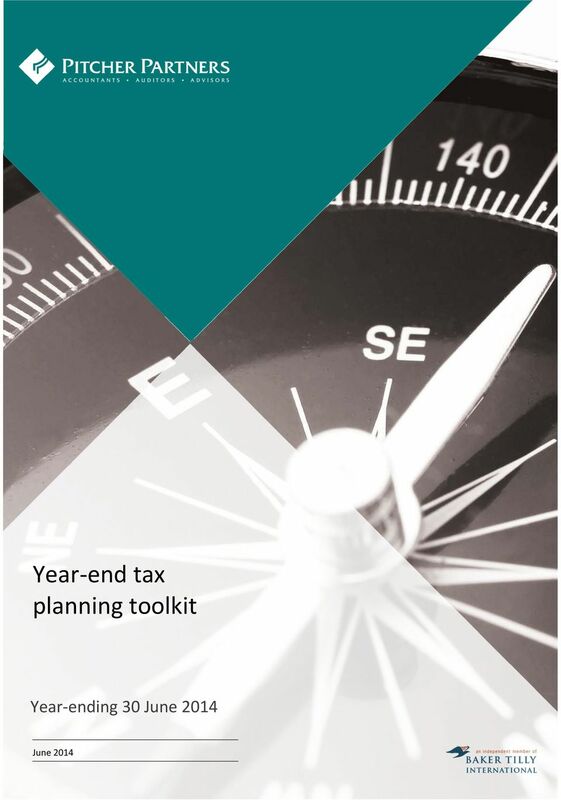 Download "Year-end tax planning toolkit. Year-ending 30 June 2014"
2 The contents of this document are for general information only and do not consider your personal circumstances or situation. Furthermore, this document does not contain a detailed or complete explanation of the law, as provisions or explanations have been summarised and simplified. This document is not intended to be used, and should not be used, as professional advice. If you have any questions or are interested in considering any item contained in this document, please consult with your Pitcher Partners representative to obtain advice in relation to your proposed transaction. Pitcher Partners disclaims all liability for any loss or damage arising from reliance upon any information contained in this document. Pitcher Partners Advisors Pty Ltd, May All rights reserved. Pitcher Partners is an association of independent firms. Liability limited by a scheme approved under Professional Standards Legislation. 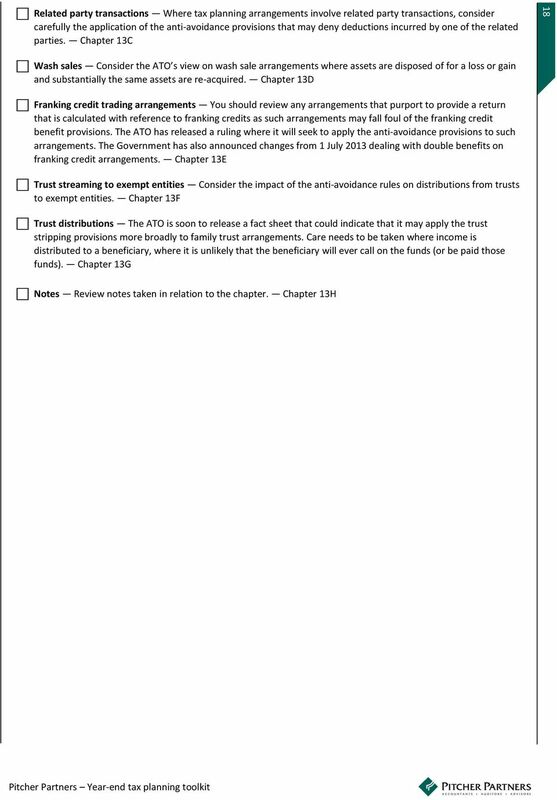 5 5 1 Introduction Welcome to the Pitcher Partners 30 June 2014 year-end tax planning toolkit. 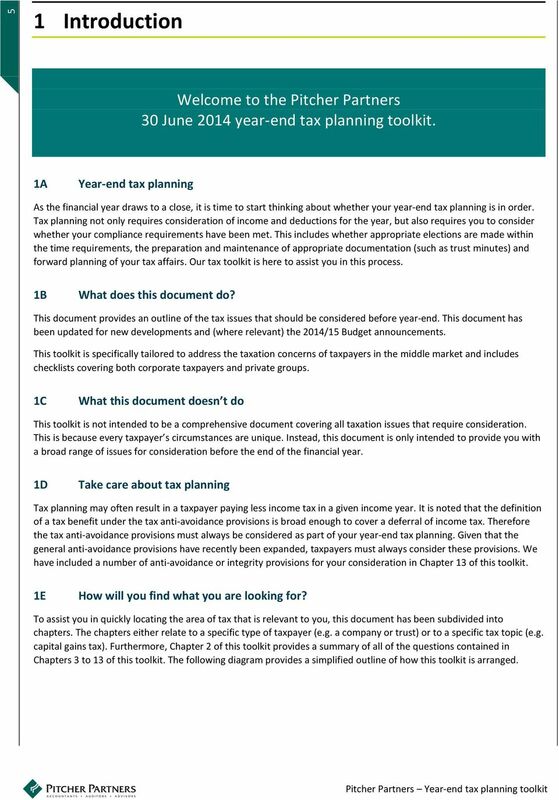 1A Year-end tax planning As the financial year draws to a close, it is time to start thinking about whether your year-end tax planning is in order. 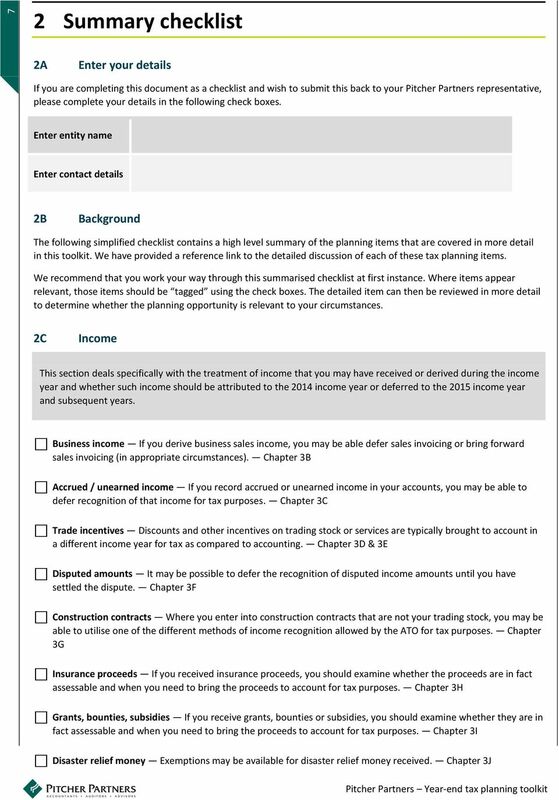 Tax planning not only requires consideration of income and deductions for the year, but also requires you to consider whether your compliance requirements have been met. 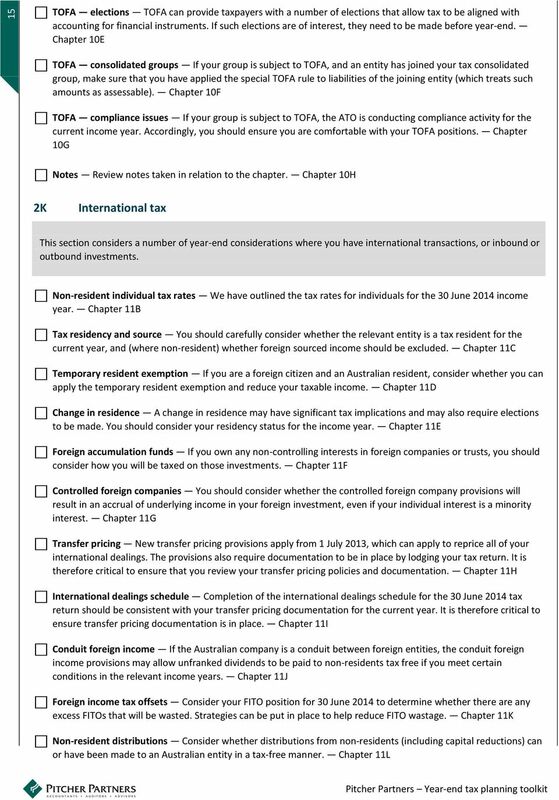 This includes whether appropriate elections are made within the time requirements, the preparation and maintenance of appropriate documentation (such as trust minutes) and forward planning of your tax affairs. Our tax toolkit is here to assist you in this process. 1B What does this document do? 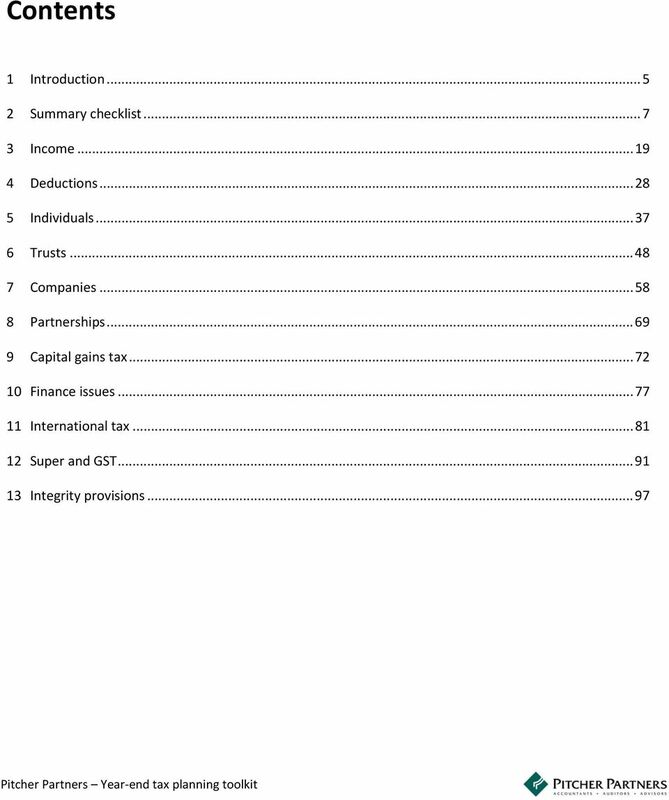 This document provides an outline of the tax issues that should be considered before year-end. This document has been updated for new developments and (where relevant) the 2014/15 Budget announcements. 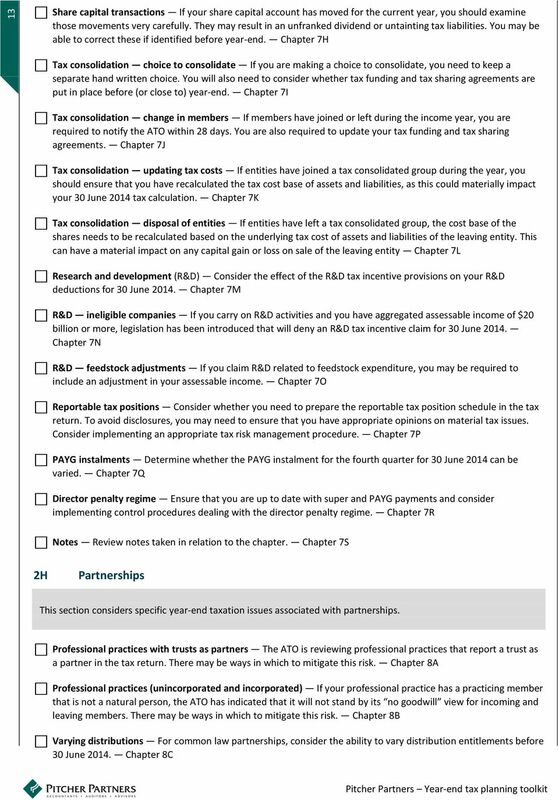 This toolkit is specifically tailored to address the taxation concerns of taxpayers in the middle market and includes checklists covering both corporate taxpayers and private groups. 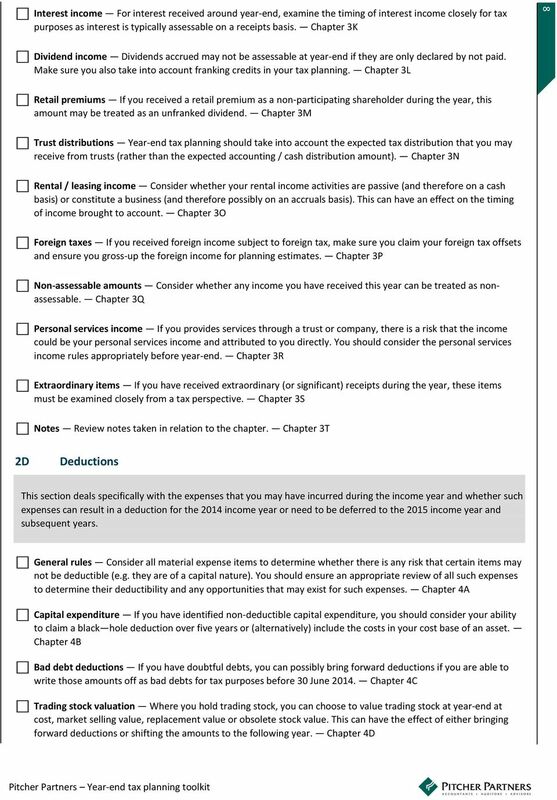 1C What this document doesn t do This toolkit is not intended to be a comprehensive document covering all taxation issues that require consideration. This is because every taxpayer s circumstances are unique. 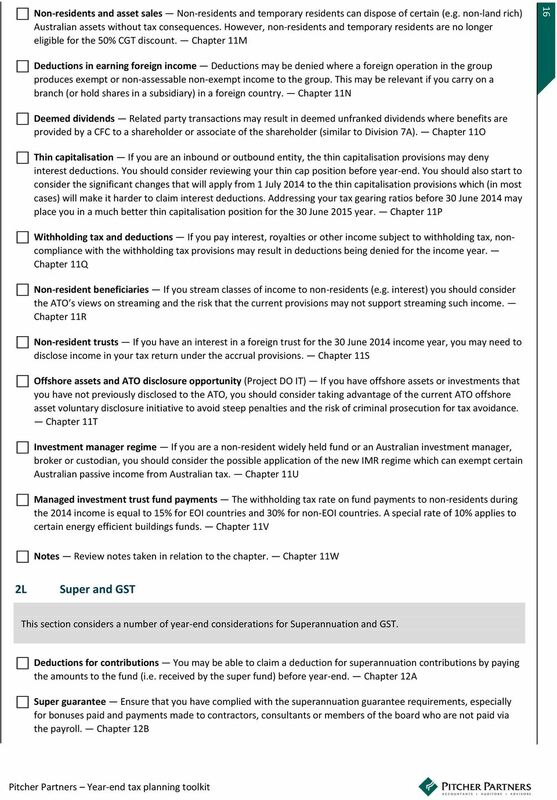 Instead, this document is only intended to provide you with a broad range of issues for consideration before the end of the financial year. 1D Take care about tax planning Tax planning may often result in a taxpayer paying less income tax in a given income year. 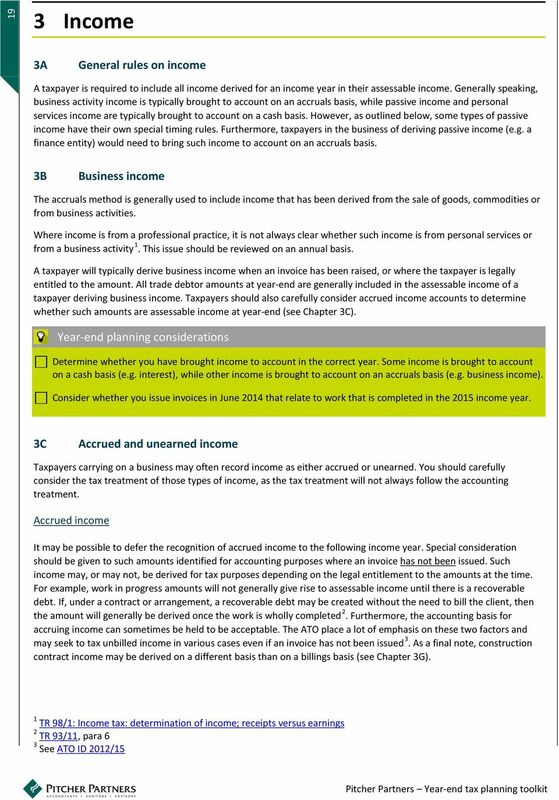 It is noted that the definition of a tax benefit under the tax anti-avoidance provisions is broad enough to cover a deferral of income tax. Therefore the tax anti-avoidance provisions must always be considered as part of your year-end tax planning. Given that the general anti-avoidance provisions have recently been expanded, taxpayers must always consider these provisions. 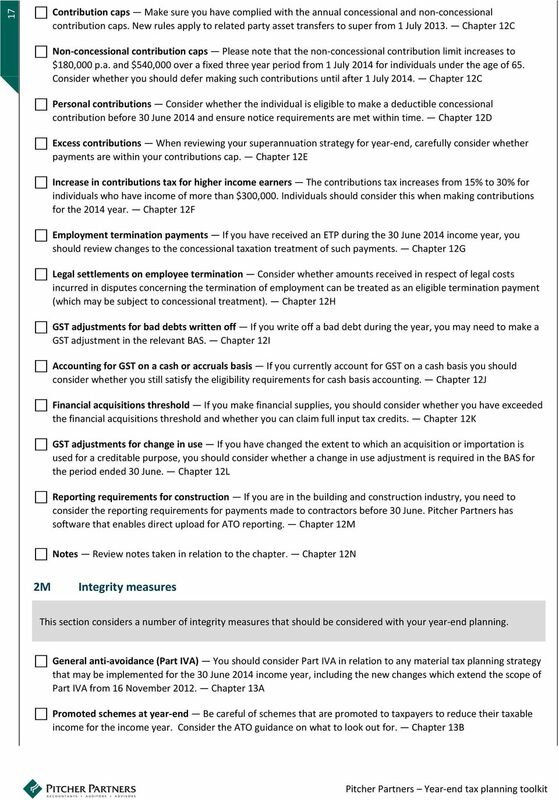 We have included a number of anti-avoidance or integrity provisions for your consideration in Chapter 13 of this toolkit. 1E How will you find what you are looking for? 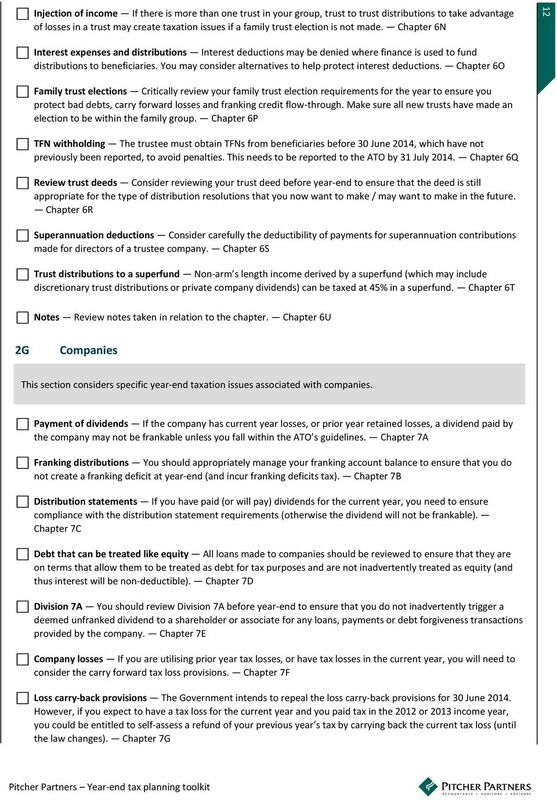 To assist you in quickly locating the area of tax that is relevant to you, this document has been subdivided into chapters. 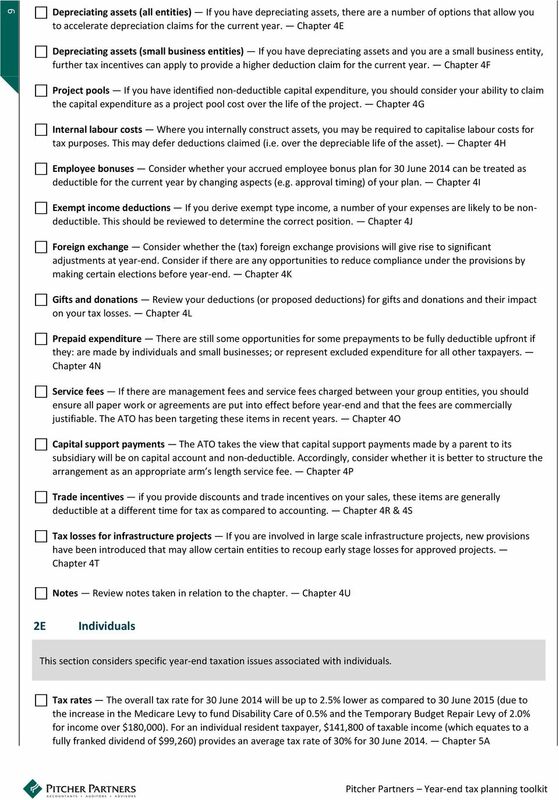 The chapters either relate to a specific type of taxpayer (e.g. 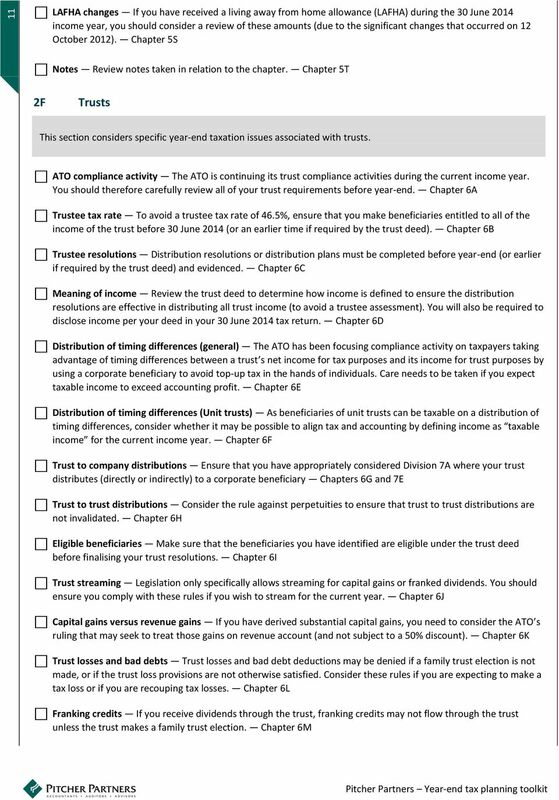 a company or trust) or to a specific tax topic (e.g. capital gains tax). 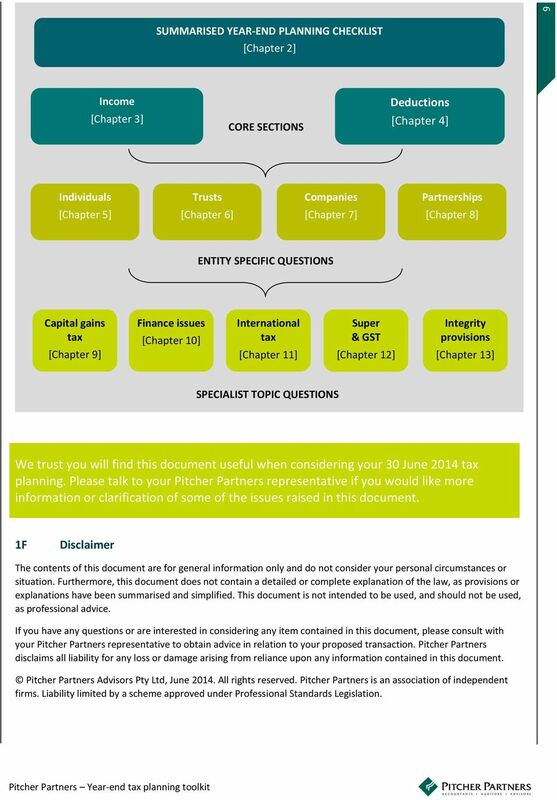 Furthermore, Chapter 2 of this toolkit provides a summary of all of the questions contained in Chapters 3 to 13 of this toolkit. The following diagram provides a simplified outline of how this toolkit is arranged. 6 6 SUMMARISED YEAR-END PLANNING CHECKLIST [Chapter 2] Income [Chapter 3] CORE SECTIONS Deductions [Chapter 4] Individuals Trusts Companies Partnerships [Chapter 5] [Chapter 6] [Chapter 7] [Chapter 8] ENTITY SPECIFIC QUESTIONS Capital gains tax [Chapter 9] Finance issues [Chapter 10] International tax [Chapter 11] Super & GST [Chapter 12] Integrity provisions [Chapter 13] SPECIALIST TOPIC QUESTIONS We trust you will find this document useful when considering your 30 June 2014 tax planning. Please talk to your Pitcher Partners representative if you would like more information or clarification of some of the issues raised in this document. 1F Disclaimer The contents of this document are for general information only and do not consider your personal circumstances or situation. Furthermore, this document does not contain a detailed or complete explanation of the law, as provisions or explanations have been summarised and simplified. This document is not intended to be used, and should not be used, as professional advice. If you have any questions or are interested in considering any item contained in this document, please consult with your Pitcher Partners representative to obtain advice in relation to your proposed transaction. Pitcher Partners disclaims all liability for any loss or damage arising from reliance upon any information contained in this document. Pitcher Partners Advisors Pty Ltd, June All rights reserved. Pitcher Partners is an association of independent firms. Liability limited by a scheme approved under Professional Standards Legislation. DOING BUSINESS IN AUSTRALIA. Presented by Sean Urquhart Tax Partner at Nexia Australia T: 61 2 9251 4600 E: surquhart@nexiacourt.com. 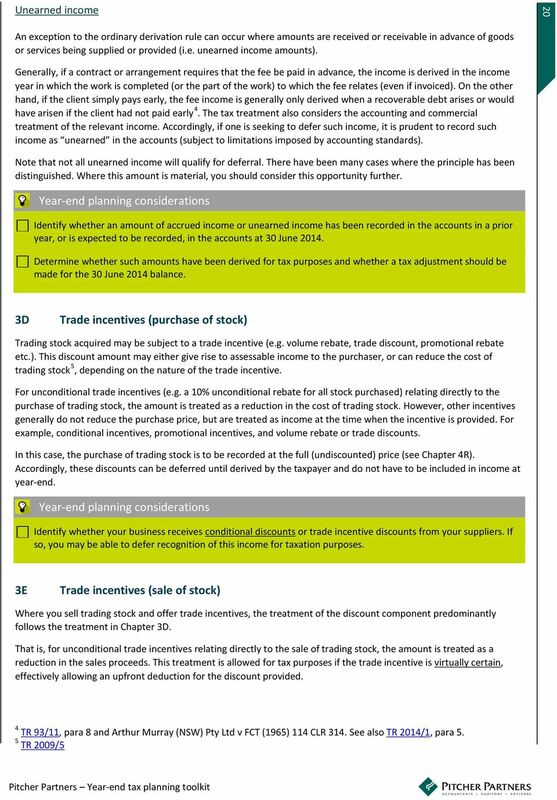 NB: receipt of an allowance does not automatically entitle an employee to a deduction. 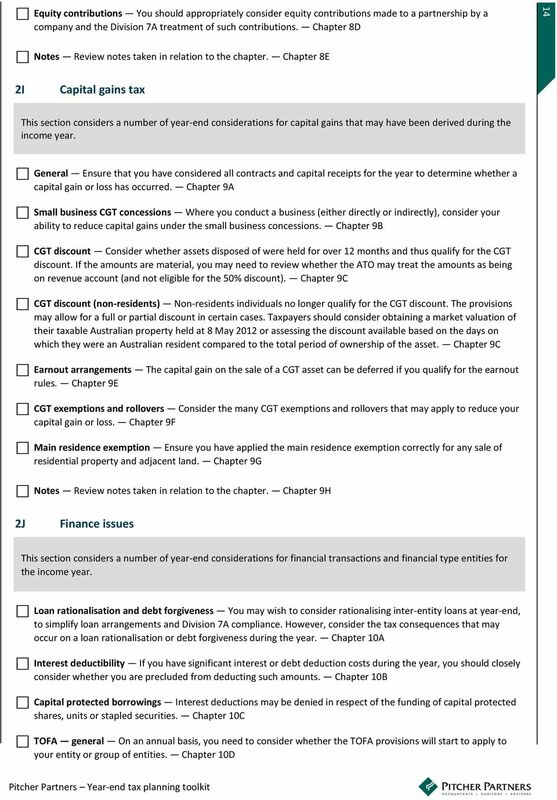 Compare to ATO Portal report. 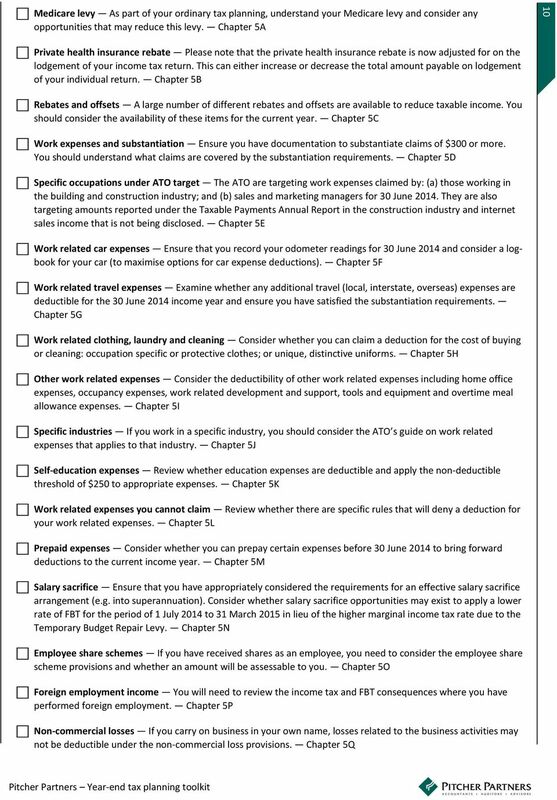 The interview checklist is a series of questions to assist clients and tax practitioners complete tax returns efficiently and consistently and to help identify relevant tax issues for special consideration. According to a recent International Monetary Fund study, Australia is in the top ten wealthiest countries in the world. With an educated and skilled workforce, it presents great opportunity for expansion.